I've been sitting on these photos for a while -- obviously, since you're certainly noticing that my hair is still long here. They were taken right before the chop and then fashion month happened and I wanted my coverage to be uninterrupted, therefore I decided to save them for later. I'm excited to share them because I'm in love with the city vibe they capture. That's the beauty of shooting on the streets of New York City: there's always going to be something in the photo that is bigger than yourself, that is rivaling for the spotlight and that nearly succeeds at upstaging you. Looking chic and effortless is at the very core of my style credo -- too much polish doesn't feel right and sloppiness just isn't in my sartorial vocabulary. Upon a recent people-watching seance (one of my favorite activities, especially in this city), I inevitably started finding associations between the dwellers passing me by, with one specific thing jumping out: a certain attitude. Whether or not they subscribe to my personal ideology of dressing-like-you-don't-care-but-secretly-you-do, New Yorkers are a mixed bag: all sorts of different dispositions roam the streets, personas and characters abound, and takes on fashion are executed in a thousand ways. The inspiration is endless. Going back to me, though (ha), the way I approach getting dressed is very straightforward: taking simple pieces that, once paired up, come together really well as a whole. And then I try to add a little something that can elevate the entire thing, like a great shoe, a scarf, or in this case, a bright lipstick. I've worn many variations of this look: replacing the skirt with jeans, or swapping out the stilettos for a flat boot. 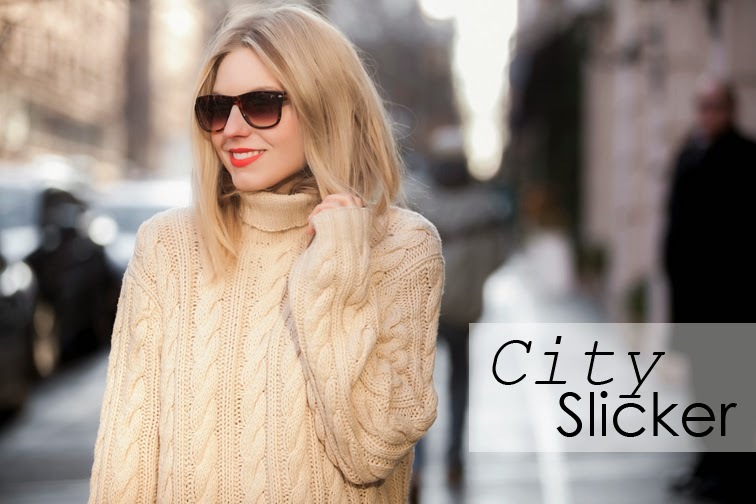 It's easy, versatile and, I think, a prime demonstration of the effortless chic city slicker. Never seen a cable knit look so good! I love the slim silhouette stiletto-heeled boots and black tights give and the top half of this outfit is the perfect effortless balance. Hope those last corners of pavement snow/slush are gone by now! Need you for Spring styling inspo don't I. Obsessed with these pics for the same reasons you are. LOVe how the city plays as prominent a role as you and your outfit do. The shot of you on the stairs! LOVE!! Also completely agree with your laissez-faire I tried/I didnt try attitude towards dressing.style.fashion. Even if i did try, I could never look completely polished. Something innately is always a little off ;) (Seeking) Perfection is literally not even a word in my vocab/personal dictionary. Absolutley gorgeous photos - your outfit is effortless and flawless - you look so so chic. I love the polo neck so much and can't wait to see your hair!! Love it here though, oh new york I love you too lol!! Love that sweater. It looks so cozy, and the color is gorgeous! Love this cozy chunky knit sweater, looks so chic and modish. & i adore watching people in the city! especially when i'm shopping around near madison and then union square; SO many different kinds of people & styles, its fantastic! Love this look, I have been wanting to get a sweater like this but I guess it may be a wee bit late in the season now, but there is always next year! I have a pleather shirt I got from H&H which would look perfect with a sweater like this. Cool blog following via Bloglovin.